Mike Pease is a professional artist specializing in Northwest landscapes. 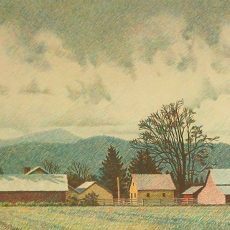 He works in both watercolor and colored pencil, though his larger works are primarily in colored pencil, He is best known as a pioneer in the use of colored pencil as a fine art tool. Mike’s background includes architecture, teaching, and writing, as well as art, though he has focused primarily on art since the early 1980s. He was Associate Professor of Architecture (teaching design, history/theory, and drawing) at the University of Oregon until 1987, when he resigned to give his full attention to professional work. Mike’s artwork is in public, institutional, and private collections worldwide, and his work and methods have been described in many books and articles.